About a year ago, a French beauty blogger told me she was extremely faithful to the Dior Diorsnow line to keep her hyper-pigmentation in check, and to keep her skin hydrated and glowing (and yes - she had amazing skin). So I gave Dior Diorsnow White Perfection Anti-Spot +Transparency Brightening Serum a try, and was impressed. 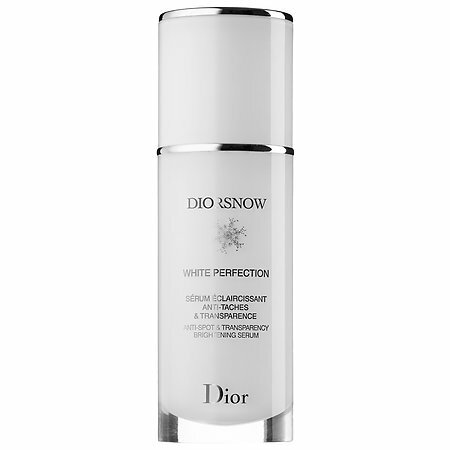 Dior Diorsnow White Perfection does not contain hydroquinone, but rather an exclusive complex containing Edelweiss with mallow extract and their Transparency Enhancing complex. The combination activates a brightening mechanism in skin—improving dark spots and evening out skin tone and texture. I usually have just a few hyper pigmented spots on my cheeks and jawline from occasional breakouts. I liked the fact that this was not only a spot treatment, but also a moisturizing serum, so on most days I only used Dior Diorsnow White Perfection Anti-Spot +Transparency Brightening Serum after cleansing. Dior Diorsnow White Perfection Anti-Spot +Transparency Brightening Serum is medium weight and very silky, absorbing into my skin easily and quickly. I used the Brightening Serum consistently 2x a day for 3 weeks. Each day I noticed how much brighter and glowing my skin looked. My dark spots took a little longer to fade, but by the 3rd week, the two spots I had were more than 50% lighter. I also loved the moisture the serum gave my skin, and it worked beautifully under my makeup. While it hydrated my skin, it didn't cause my more oily areas around my t zone to become more oily, or clog my pores. After several months, those older hyperventilation spots are gone, and I'm officially hooked on Dior Diorsnow White Perfection Anti-Spot + Transparency Brightening Serum . I plan on having it being a permanent part of my skincare collection.